Redding's Imperial Application Media with Dry Neck Lube solves the problem of lubricating case necks for the sizing operation. On the back stoke of case sizing, the expander pulls back through the resized neck and expands it to its final inside diameter for seating a bullet. Sometimes this process can drag hard because there is no lubricant on the expander. Dry lube was the answer but it used to be slow, tedious, and messy. Not Anymore! This is the easy way to apply dry neck lube to case necks. Simply dip the cartridge case neck into the ceramic media. The media consists of high density ceramic spheres that are pre-charged with Imperial Dry Neck Lube. 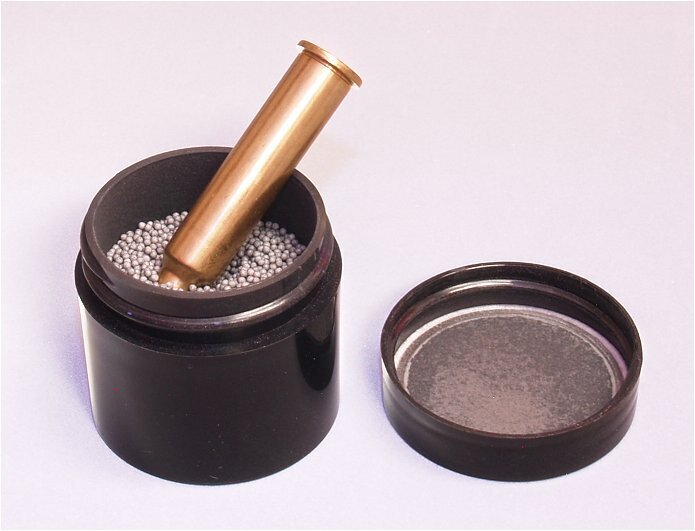 This can be used with all cartridge cases including 17 cal. Watch a video demonstration at our Redding Home Page. At last a perfect way to lube the inside of a case neck and it is fairly clean as well. everyone should use it especially when expanding case necks.